The 45th Tokyo Motor Show is about a week away, and Toyota is bringing this: the Fine-Comfort hydrogen fuel-cell concept. The company calls it “a new form of the premium saloon,” which I guess means “weird futuristic minivan” in Toyota-speak. The Fine-Comfort, whose name reminds me a bit of the venerable Crown Comfort that serves dutifully as a taxi cab around the world—promises to solve a lot of the world’s automotive problems. For one, it—like many Toyota concepts before—has a hydrogen fuel cell on board, which means it releases no CO2 or “substances of concern” (as Toyota puts it in the press release). That’s a good thing, considering the current attitude towards conventional internal combustion engines (and the fact that the theme for this year’s Tokyo Motor Show is “Beyond the Motor”). Toyota says the concept minivan offers over 600 miles of range (on Japan’s JC08 cycle), and can be refueled with hydrogen in about three minutes. The seats can swivel, making the car into a “communication space for individuals,” and the windows surrounding the passengers are displays. 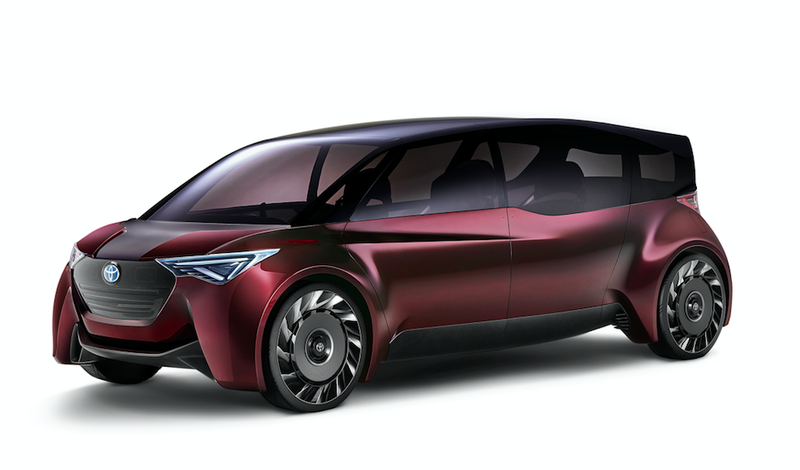 It’s a loony concept that makes sense in a lot of ways, but with a lack of Hydrogen infrastructure, and Toyota’s own admission that it needs to get into the battery-electric vehicle game, this Far From Feasible, B-Pillar-less, Swivel Seat-having concept minivan seems a bit silly.